Here’s a page on Christmas Fun in the Capital District. We live in the Capital District, people. It’s Upstate New York. Your choices from December through March are: 1) become increasingly miserable or 2) embrace winter. Let’s embrace winter, shall we? Come on! There’s plenty of fun to go around. My Embrace Winter article is an introduction to winter sports like snowshoeing, skiing, and ice skating, along with tips for getting started. Here’s a post on sledding hills. Here’s a list of places to go tubing. Here’s a post on snowshoeing at Thacher. I know how to rock a snow day. Read this and you will, too. This Skis post lists a few places where you can find seasonal ski rentals, much cheaper than renting by the day. This post on Rates for Skiing Day Trips is outdated, now, but it gives you an idea of what’s out there. Here’s the KidsOutAndAbout page of Skiing Within Driving Distance of the Capital District. 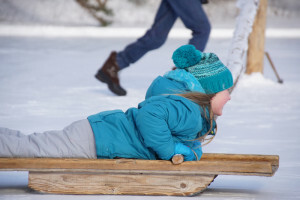 KidsOutAndAbout Review of Ski Butternut in Great Barrington, MA. Capital District Fun visits Maple Ski Ridge. KidsOutAndAbout Review of Mount Snow in West Dover, VT.
Here’s a post about Jiminy Peak, and another post about Jiminy Peak. Albany Kid came up with a big list of places to ice skate, both indoors and outdoors. All Over Albany provides an ice skating map. Here’s a post about skating at Collins Park. Here’s a post about making a backyard skating rink. A silly post on preparations for a snow day. Here’s a guest post on Fun Stuff to Do with Little People When It’s Nasty Out. Here a post in which I got fed up with embracing winter. Even I have my limits.